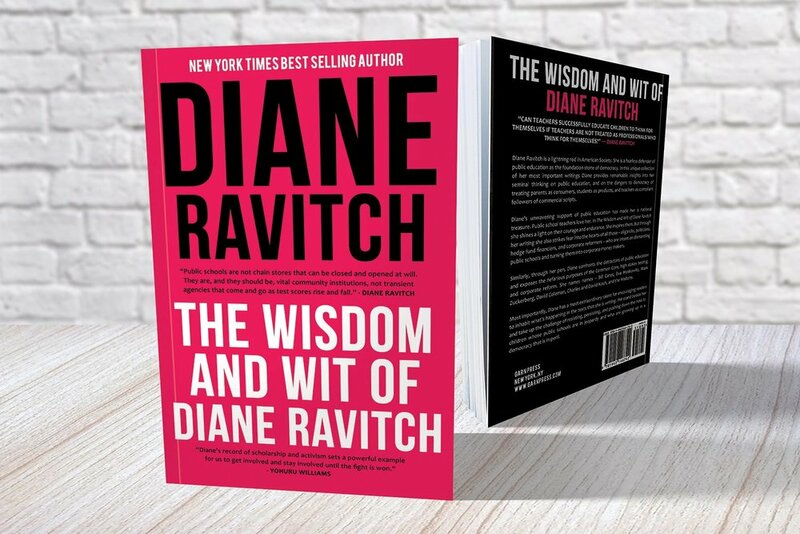 The Wisdom and Wit of Diane Ravitch by Diane Ravitch is now available (new release). Shop on Amazon, Barnes & Noble, IndieBound. Anthony Cody is the author of the NCTE George Orwell Award winning book The Educator And The Oligarch. We think of historians as observers after the fact. They pore over the ephemeral and permanent records of past times and, from that evidence, construct stories that help us understand, and see the larger patterns at work. Diane Ravitch is a historian working in the now. She has an understanding of the history of our nation and education system that enables her to place current events in a schema that makes sense. Part of her relevance is that Diane Ravitch is more than a historian. She is an active participant in public discourse, and the essays captured in this book are among her most important contributions over the past decade. When she joined me in launching the Network for Public Education back in 2013, she stepped even further into the arena. In January she was seen speaking in support of the Los Angeles teachers strike. Her latest book, The Wisdom and Wit of Diane Ravitch, published by Garn Press, is an invaluable guide to the past decade of education “reform.” It is a contemporaneous history of a host of fatally flawed projects, including the Common Core standards, charter schools, vouchers, Race to the Top, and paying and/or evaluating teachers based on their students’ test scores. Some of these issues remain hotly contested. We do not hear a lot about the Common Core these days, but the standards struggle on, often under aliases. The history of these standards is a subject where there has been an active effort to hide the machinations at work behind the scenes. How many articles have appeared in education publications and web sites purporting to “bust myths” about the Common Core– often denying basic facts about how these standards came into being. The most valuable history lessons in this book are in the middle section, where we see Ravitch systematically come to terms with what the Common Core is all about. Ravitch does not treat her subjects lightly. When she takes on something like teacher evaluation, she goes into depth on why using test scores will damage our students. She explains the track record for the practice, and how conditions in schools make this counterproductive. Her analysis of charter schools does not simply look at test scores and graduation rates, but at deeper questions such as how these schools affect the public schools they are competing with. How do we maintain a vigorous democracy when schools are controlled by privately appointed boards? Her own background as a “reformer” gives her insights into the flawed thinking that allows such schemes to take hold. Ravitch is sometimes portrayed as a naysayer, but we also find descriptions of what we should be doing instead. She describes the advances made by schools in Finland, which she visited in 2011. She contrasts their holistic approach with the market schemes driving corporate reform in the US. In the end, her willingness to confront and condemn the complacency towards the crimes of wealth and privilege is what makes Diane Ravitch a treasure to teachers across the country. This book is a lively look at history as it unfolds, in the voice of the most reliable narrator of our time. Thanks to Diane for writing it, and for Garn Press for bringing it to us in this new form. You can order it here.